A colleague and good friend, Dave Burke, reached out to me recently for some ideas around adding and subtracting fractions. In particular, he was interested in trying to make the topic a little more enjoyable by adding some context. This was a challenge I was really eager to work on because working with fractions is such a sore spot for so many students and their teachers. In the past, I tried to help make dividing fractions less abstract by using the idea of dividing chocolate bars. With this in mind, I figured using chocolate bars for adding and subtracting would be a good starting point to move towards multiplication and division later. I was surprised when I reviewed the grade 7 curriculum to find that the idea of dividing whole numbers by simple fractions was listed before adding and subtracting fractions. The more I thought about this, the more I like it. However, I stuck to adding/subtracting first. Can’t see the embedded Knowledgehook Gameshow question? Click here. How many pieces of a whole KitKat bar are there? I’ve been using Knowledgehook Gameshow as a way to keep my lessons interactive almost daily. The best feature is the upload solution tool (not available when embedded in websites) that allows me to share out student work instantly over the projector. I find using Gameshow makes it even easier for me to be the facilitator of the learning rather than the gatekeeper of knowledge. Typically, the solutions students share is enough to consolidate most tasks and I can minimize the amount of direct instruction I must deliver. It is always nice to be able to show students the solution for a little celebration. This is where I see Gameshow could make an improvement. Have the option to add a “solution page” where you can insert media, rather than me having to open a video file or run a slide deck. Then, we continue on, slowly raising the bar on the complexity of the problems, but keeping the context the same. Students can then evaluate the expression. 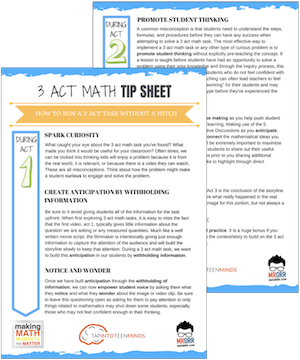 Task 2, Act 3 – Watch the Answer! Ask students to talk to their neighbours about what question we might ask here. The goal is to have them realize that they are going to need to do some addition and subtraction of fractions. Students can then evaluate the expression in Knowledgehook Gameshow. Task 3, Act 3 – See the Answer! Ask students to talk to their neighbours about what question we might ask here. Some students might say we are adding, which is great. However, I wonder if any students will notice that we are not only adding, but we are doing repeated addition (multiplication). Students can then give their take on what they think will happen. Let students chat it out and then, when they are ready, they can give an open response of their thinking. After exploring some of the open responses submitted by students, we can ask them to determine the answer to the problem. Give them an opportunity to solve the problem by evaluating and interact with their classmates. Students are then given some time to discuss what they think might be going on here and then they share out their thinking. Then, students can solve and share out their solutions. Grab the task resource downloads so you can run this task without a hitch! That’s it for now, but I do have a huge bag full of other chocolate bars that I intend to eventually use to make more problems involving fractions. Let me know how you like this one so I know if it is worth putting in the extra effort. Hope you enjoy using this task. If your and your students enjoyed using the task, be sure to leave a comment below and let me know how it went! Hey Kyle, This is such a great series of activities to meet the grade 7 curriculum expectations. I especially love the concrete and visual aspect. It really helps students understand order of operations. I am wondering if there needs to be a different video for Task 5 Act 3. It appears to be the Task 4 Act 3 video. Thanks for all you do to make the rest of us look amazing!! That was supposed to say it really helps students understand operations with fractions. My brain’s auto pilot clearly kicked in and my fingers typed order of operations by accident. Thanks so much for stopping by! Glad to hear that you find the task useful in your quest to engage students and fuel their sense making!